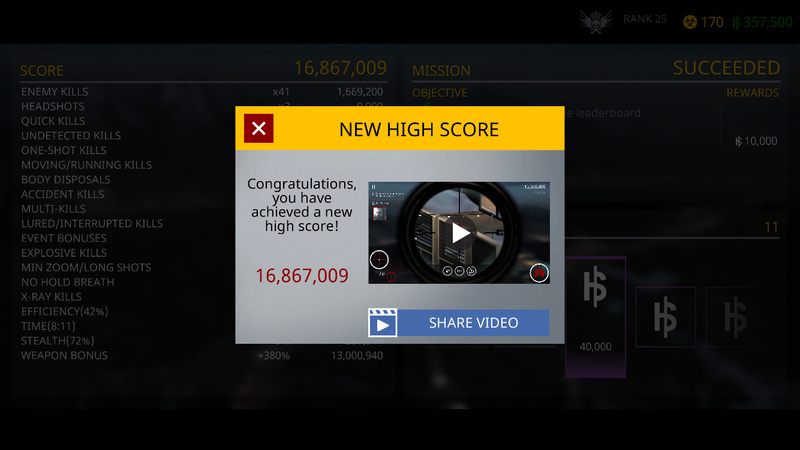 Hitman Sniper: Share your high score? How do you find the score needed to obtain the Adiago rifle? Unfortunately reasons out of my control I’m not able to give you the exact score you would need to get in the Assassin Tier, but from recent interactions with the community I’d say you would need around 23 million points. Wow, what rank are you at this point? Has to be close to 1000! Thanks for a wonderful piece of advice, I really enjoyed watching you play. As for the topic, I’m currently at 23,495,178, just got my Adagio rifle the other day. happened over a one day period. Thanks much! Thanks for reaching out. After a quick investigation, I’ve just posted this little note on our Facebook page. Some of you might be wondering why you might have dropped in rank suddenly overnight. Our leaderboards stopped being updated for a little while while we were fixing some issues in the background. Yesterday, they got back to normal and will now update even more regularly. That means a lot of people’s highscores weren’t visible for some time and now they are. I’m at just over 4 million Bit of a noob at this game, but I’m gonna keep trying at it. Mine is 25M, yet I am nowhere near the best 1000 scores (currently ranked 3600s). I would love to achieve the fifth trophy (worth 20K XP) on Play. I have no idea if this is actually good or not. I just started playing this game. It’s a lot of fun, but WTF? They’re selling guns for $49.00!?! This is what I was really worried would happen to the Hitman franchise when SE let IO go. Glad to see it didn’t happen. Oh,… only NINETEEN MILLION??? WTF DUDE? I had no idea the score even went that high! I’ve got 17, 097,736 but Im still in a platinum division ? What should I do ? What is exact score to be an Assasins Tier ? Minha pontuação atual é 21, 335, 060. Eu estou no nível 25. Quero continuar e quebrar meu próprio recorde! My best so far is around 24.7 million… that has been there for the last week… I almost completed the game last month but then i reset the game to chapter 2… and since then I haven’t really played it that much! I really wanna enter the Assassin Tier, my current global rank is 1331.